Hair: most of us take pride in it, many are obsessed with it, even those who claim to be indifferent would still probably break down if anything happened to it. In a world where public image is increasingly important to us, how can you protect your hair? Have you ever experienced ‘hair gone wrong’? This website is intended to outline common but nonetheless traumatic hair disasters many people face and what to do about them. In a progressively more media-focused culture, hair is becoming a larger concern, particularly to younger people. The use of hair dye has dramatically increased in the last decade and consequently hair disasters are more and more common and their nature more widespread. A internet search for hair horrors results in numerous examples of people who have experienced a shockingly dramatic hair ‘fail’ but also stories of people from more physically pressing issues such as hair loss, skin problems and allergic reactions. The problems may be varied but our reaction to them is always the same: distress. While many experience problems using shop bought hair dye, hairdresser’s negligence is also a large problem. When you visit a hair salon, as a paying customer you expect to be treated with care, skill and competence. If you find yourself subjected to injury through negligence, you may be entitled to compensation. 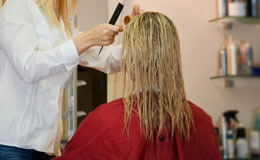 Hairdressing accidents are more common and more serious than many people imagine. The chemicals used for bleaching, colouring, perming and straightening hair are all strong and can cause chemical burns to the skin or scalp if used incorrectly. Procedures such as overprocessing or the wrong chemical treatments can cause your skin to redden, swell, blister, flake, crack and itch. It can cause your hair to break off and even fall out. A substance known as Paraphenylenediamine (PPD) is present in more than two thirds of permanent hair dyes in the UK despite it often resulting in the user contracting dermatitis or violent allegic reactions. The use of PPD in hair dye is yet another reason why it is very important for hairdressers to be aware and very careful of their customers’ safety. Problems caused in the salon can be very dangerous and both painful and distressing to the customer. All aspects of life are subject to human error but, in the majority of hairdressing cases, disaster can be avoided by care and professionalism. This website is created and managed by Macks Solicitors. If you feel you have suffered at the hands of a negligent hairdresser, you may be entitled to claim for compensation. Contact us now through the online claim form below or visit our advice pages on the rest of the ‘Hair Gone Wrong’ site. Macks have a specialist team who deal with hair damage, scalp burns from chemical processing, allergic reaction to hair dye following a failure to complete the patch test, and all other aspects of hairdresser’s negligence. At Macks Solicitors, we offer quality caring service and expert advice to ensure you receive the compensation you deserve. "You started off looking for a new hairstyle, short hair styles, long hairstyles, blonde, brunette, auburn or black hair, but has your dream new hairstyle turned into a hairdressing nightmare? Remember it's not your fault, it's not what you wanted, and although we can't fix your hair we might be able to get you the compensation you deserve. Call us now for a no obligation free chat about your own situation." Hairdressing Accidents – What Should I Do? Hairdresser Negligence or Hairdresser Mistake?